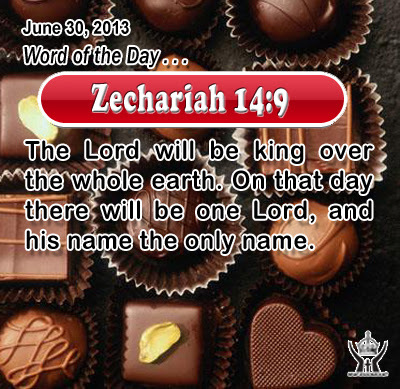 Zechariah 14:9The Lord will be king over the whole earth. On that day there will be one Lord, and his name the only name. Great Almighty LORD, work to bring yourself glory, not only in us, but in your people, and in our time of history. With all our heart we pray for your name to be reverenced in all the earth. Do mighty works that show your control and sovereignty to help your people bring others to call on your name and to praise your grace. In Infant Jesus' name we pray. Amen. 51When the days drew near for him to be received up, he set his face to go to Jerusalem. 52 And he sent messengers ahead of him, who went and entered a village of the Samaritans, to make ready for him; 53 but the people would not receive him, because his face was set toward Jerusalem. 54 And when his disciples James and John saw it, they said, "Lord, do you want us to bid fire come down from heaven and consume them?" 55 But he turned and rebuked them. 56 And they went on to another village. 57 As they were going along the road, a man said to him, "I will follow you wherever you go." 58 And Jesus said to him, "Foxes have holes, and birds of the air have nests; but the Son of man has nowhere to lay his head." 59 To another he said, "Follow me." But he said, "Lord, let me first go and bury my father." 60 But he said to him, "Leave the dead to bury their own dead; but as for you, go and proclaim the kingdom of God." 61 Another said, "I will follow you, Lord; but let me first say farewell to those at my home." 62 Jesus said to him, "No one who puts his hand to the plow and looks back is fit for the kingdom of God. Tolerance is a much needed virtue today. But aren't we often tolerant for the wrong thing or for the wrong motive? Christian love seeks the highest good of both one's neighbor and one's enemy. When the Lord calls us to follow him he gives us the gift of grace to put aside everything that might keep us from doing his will. Faithfulness to Jesus requires sacrifice, letting go of my will for God's will. A probable disciple responded by saying, I must first go and bury my father, that is, go back home and take care of him until he died. Jesus certainly did not mean that we should say no to care for others, especially our parents in their old age. His surprising statement, however, made clear that God must always be the first in our lives. If we love him above all, then everything else will fall into its proper place and time. Jesus surprised his disciples by telling that they must not look back but keeps their focus on the goal set for their lives full happiness and union with God. A plowman who looked back caused his furrow to be crooked. Similarly, if we keep looking back to what we left behind, our path in following God will likely go off course and we'll miss what God has for us. When the going is rough or the way ahead looks unsure, we are tempted to look back to the "good old days" or to look for "greener turf". Are you resolved to keep your eyes fixed on Jesus and to "stay the course" in following him to the end?